Year ago, I was deeply hurt by someone I’d loved for many years. For months, I walked around in a cesspool of despair, asking myself the same questions over and over: How could he do that to me? How could I have been so stupid? How can I trust anyone again? I couldn’t see how there could be ‘Easter’ within all my overwhelming pain, but her words and the gentle way in which she spoke them drove a wedge in my endless regurgitation of anger, and they gave me hope that one day I would be whole again. I hung on to that hope and, more importantly, began acting on that hope. Eventually my Easter arrived. I learned to smile again, trust again, and most importantly, to forgive and move on. I still remember that painful time with some regret and sadness – Good Friday was not meant to be forgotten – but my Easter, my renewed life, was worth working for. Each year since then, something reminds me of that conversation and my renewed faith in rebirth. This morning it was a single bloom on my Christmas cactus. This type of cactus blooms in November and December, thus its name. I have two of them, and after they bloom, I pretty much leave them alone. They don’t need much water, so they just sit on the dresser until summer when I set them on the porch where they soak in the sun for a few months and prepare to bloom again. During the past year, I’ve received emails from several readers expressing that kind of Good Friday desperation stemming from their attempt(s) to lose weight. They live in a darkness that originates in self-loathing. They are angry with themselves for their seeming inability to lose weight, and they are desperate to find the secret to flipping that switch that will turn on their accountability and motivation forever and not just for a few days or weeks. When I was head first in depression and despair, I looked everywhere to find relief from my suffering. Everywhere, that is, except inside myself. It was only when I believed in that hope of Easter and then worked toward that hope that I could see the light at the end of the tunnel. And the only way that belief and work and light came to be was through finally accepting that I truly was good enough to love. I had to dig deep inside and admit that I was all I had in this world, and if I didn’t love me, no one could. 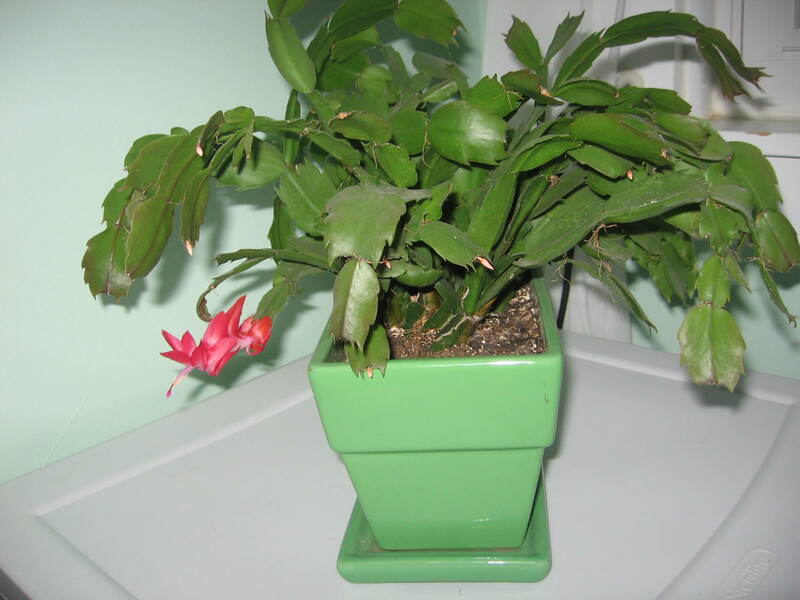 The single pink bloom on my Christmas cactus reminds me that you, me, everyone has the ability to bloom, even out of season, even in the midst of Good Friday despair. We might need help along the way in the form of professional counseling or the love of a good friend. But loving ourselves is the key – the “secret” – to Easter, and the work it takes to rebirth ourselves, to build that new life, is worth every tear, every drop of sweat, and everything we say “no” to. Spring, Easter, Passover…whichever rite or holiday you celebrate this time of year, each is a reminder of life and rebirth and hope. My hope for all of you is peace. Even if you’re living in the pain of Good Friday, Easter will come. It always does. Next week, Charlie Hills (author of the blog Back To the Fridge) will kick off a two-week virtual book tour to promote his latest book, “Why Your Last Diet Failed You (And How This Book Won’t Help You On Your Next One).” Lynn’s Weigh will post an interview with Charlie on Thursday, April 16. Join us Thursday, April 16, for our “interview” and the chance to win a copy of Charlie’s new book! This entry was posted in Uncategorized on April 10, 2009 by Lynn Haraldson. Beautiful Lynn. We love others but not ourselves and its so very painful. Thank you for writing this I was meant to read it. Happy Easter. Lynn, I got a tear in my eye reading this, what a wonderful post to read at Easter time. Too funny too that I also have a Christmas catcus with one pink bloom this week *smile*. I think of what you wrote about as ‘looking for the third person answers’ instead of living/looking in the ‘first’ person.I spent a great deal of time in a hospital/surgery center last week (my mom’s husband) and was nearly emotionally buried by the obesity that I saw there. I am sure that they thought (looking at me) that I did not understand – but what I thought was that they do not understand. I think it is so hard to see a way ‘out’ when one is in the midst of it. I also totally understand that when one is stuck there – they have no idea that the physical pain can be so much better. Living pain free was one of the biggest shocks for me. It takes the right food and daily exercise and very good sleep and medicine – but if I have all of these in place – then I am able to stay pain free. If I drop the ball on one of them – the pain comes back immediately to remind me. I thought this was an especially good posting. Wonderful post! It really touched all the bases. Hoping that all attain their Easter miracle.